Most technology companies have a product management department serving as the “voice of the customer” and helping to better understand market needs. This function typically generates an extensive roadmap of new products and enhancements, but is product management really being used strategically? For example, what is the product strategy that is driving roadmap priorities? And how is the product strategy linked to the company’s overall strategy? Since most technology companies’ revenues come primarily from their products or services, you would think that the product strategy would be carefully crafted with the close scrutiny of the executive team and that it would be meticulously aligned with an overarching corporate strategy. But this is often not the case. Without the engagement of the leadership team most responsible (and presumably most qualified) for determining strategy and direction, the risk is suboptimal financial performance at best, and complete company failure at worst. Let’s take a look at some practical approaches to making product management more strategic by engaging executives in key product strategy decisions and encouraging better corporate strategic planning. The essential goal of a product plan should be to ensure that a product is built that delivers some business value to a specific set of customers in order to meet certain financial goals based upon a defined corporate strategy. Successive plans should increase that product’s effectiveness in doing so. A product plan describes the market opportunity, profiles the target customers, specifies pricing, identifies the financial goals, indicates the key priorities for development and enhancement, and provides a roadmap for delivery for at least the next four quarters. For a new product, a comprehensive MRD (Market Requirements Document) might well serve as the product plan. But each product that continues to be offered to customers should have a product plan updated every year. So, how does product management create a good product plan? Let’s assume that the product management department is already managing several products that are currently serving customers. After getting feedback from customers, speaking with the sales teams, obtaining a list of the top technical support issues, surveying competitor positions and features, and receiving new ideas from development, the product management team has generated a list of possibly hundreds of potential product enhancements across the product line as well as some new product ideas. Project prioritization typically takes place next due to limited development resources. Many companies apply some arbitrary prioritization scheme based upon the perceived number of times the feature/product has been requested or how much revenue they think the feature can generate. The product manager (or his development friends) may also make assumptions about value based upon how they think the product should be used. The product management team then creates a roadmap and a release schedule based upon these priorities and voila, the product plan is done, right? No, it certainly is not! The product plan is not complete because the company’s strategy has not yet been considered. The executives who are chartered with running the company have not had an influence on the product plan. The plan is merely a reaction to a somewhat random set of market facts and events.So how exactly does the corporate strategy relate to the roadmap? Well, the goal of almost any technology company is to increase revenues. Without a strategy to indicate HOW the company plans to increase revenue, then just about any product plan could arguably help the company achieve its goal, including the plan we just created. But with a strategy that specified how new revenue will be generated, a product plan tailored to supporting that strategy can then be developed. For example, your company could plan to grow revenue by selling its flagship product into new geographic regions. Your company could plan to grow by establishing a new reseller channel. Your company could grow by enhancing its existing products to appeal to a wider base of customers. Your company could plan to grow by developing new products that appeal to the existing customer base. Each of these decisions carries with it significant implications on the product plan. Selling into new geographic regions would require local language support and may have other specific regional requirements. Selling through a reseller channel may require multi-tier administration and branding.Enhancing products to appeal to a wider customer base requires profiling that new customer and understanding his/her unique needs and requirements. And developing new products requires new analysis, requirements, design, and development work. Thus, each of these strategies would result in a different prioritization of the projects on the product manager’s candidate list and a different allocation of resources. The product plan we created previously is reactionary and haphazard, while the product plan that responds to corporate strategy is directed and intentional. So why aren’t corporate strategies incorporated into product plans? There are several possible reasons, but three of the most prevalent ones I have come across are: 1) no strategy exists, 2) the strategy has not been clearly communicated, or 3) the strategy appears inconsistent with market and customer data. Let’s analyze each in the following sections and propose some ways to solve them. If no strategy exists, then one should be created. At one Internet Services company, the executive team employed a process where they reviewed and prioritized the top project requests every six weeks. This approach resulted in constantly shifting priorities since the highest priority projects were always related to the biggest sales opportunities at the time. Less critical product features never made the cut resulting in a product line that became increasingly uncompetitive. Without a driving strategy behind it, your company risks being jacked around by short-term opportunities. Product management is in a good position to persuade executives to develop a high level strategy as part of the product planning process.Here are some key questions that product managers can ask executives to help with product planning that might very well stimulate some strategic discussions. What are the top 3 most critical challenges our company will address this year? In which geographic regions will we focus on selling our products? Will there be any changes to the sales or channel strategy? What are the revenue and profitability expectations for each product line? Will there be any changes to the focus of marketing and advertising? Are new markets or product lines being considered for the future? What strategic partnerships are on the horizon? What resource changes are expected for the coming year? Now an astute executive may ask the product management team to answer or help answer many of these questions. And that makes some sense since product management sees market opportunities, has heard customer feedback first hand and has aggregated it from others, has tracked competitor’s moves, and has an in-depth view of their products’ financial trends. But at the same time you still want to leverage the knowledge and experience of the executive team and make sure they agree with the assumptions and logic being used. Therefore, a practical approach to strategic planning could involve a meeting (or series of meetings) where product management presents their market and customer information to executives, who then have a chance to discuss what they have heard and how they think it should apply to the future of the company. You could expand the discussion to include input from other functions like sales, marketing, and finance so that everyone is hearing key information that will lay the groundwork for the strategy. In a subsequent meeting, product management can replay the conclusions and decisions from the previous discussion(s) and then present a proposed product strategy that responds to them. Hopefully by then, a consensus on the strategy will be reached and the product management team (with the assistance of development) can then present an updated roadmap and proposed release schedule for the coming quarters for final review and approval. The second reason why corporate strategies are not incorporated into product plans is that product managers don’t know about them or don’t understand them. It is certainly possible that an executive team will define a company strategy and then will succinctly describe that strategy in a form that can be handed down to all employees for successful execution. More typically however, the executive team communicates the strategy to their teams in a less formal fashion. Atone mid-sized software company, the executives felt that the strategy was too sensitive to share broadly and tried to share it on a “need-to-know” basis only. Most of their own employees were therefore in the dark about how to successfully execute the strategy. The product management team is a key executor of the strategy. The will translate corporate strategy into product strategy and will create roadmaps that drive the work of many of the company’s employees. For product managers to thoroughly understand the corporate strategy is to significantly improve the odds of its successful execution. Thus, I would highly recommend that the entire executive team present the strategy directly to the product management team. This will facilitate the necessary dialogue and allow for a joint understanding of the implications to the product strategy. Product management should then be required to develop a product strategy and proposed roadmap and present back to the executive team to close the loop and ensure alignment with the corporate strategy. The third reason why a corporate strategy may not be adequately incorporated into product plans is that the strategy itself appears to be inconsistent or contradict market and customer data heard by product managers. This is a likely result if the executive team developed their strategy without being adequately in touch with the market and customers. If the product management team is being utilized appropriately, then they will be serving as the “headlights” of the company driving the front-end of the product development process and thus they will be spending the majority of their time discovering market opportunities, customer needs, technology trends and competitor positions. Now executives should always make it a part of their jobs to speak with customers and to review market trends. But to ensure they hear the wealth of available market and customer information, it should be considered a prerequisite to developing the corporate strategy to have the product management team present a review of what they have learned. You may have noticed that in all three of the cases where corporate strategies are not adequately integrated into product plans, we found that the solution was direct communications between product management and the executive team. Product management can help to educate senior executives with their market and customer knowledge, can help mold the strategy, and must also hear it first-hand so that they can properly execute it. However, there are reasons why this direct communication does not occur. It is quite common for the product management team to report to a VP of Marketing or a VP of Product Development who represents them at senior-level meetings. These are broad functions with many responsibilities. Marketing executives are often measured and rewarded on driving revenue (with sales) for the company. Product development executives are expected to deliver quality products on schedule. Now I am admittedly oversimplifying here, as many good executives will make decisions with a big picture perspective on business priorities beyond their direct responsibilities. But there are some general tendencies based upon short-term rewards and there are limits to a person’s time and attention. So when sitting at the strategy planning table, what types of things are they most concerned with? How well do they understand customer needs and market opportunities? Is profitability one of their primary concerns? Are they concerned with short-term or long-term issues? In other words, will they be good representatives of the market and will they push to defend the bottom-line? This brings us to a broader issue at many technology companies. Who is actually concerned with profitability and the balancing short and long-term goals? Who is ensuring that every key decision is being made with key business goals in mind? In short, who is minding the store? For most functionally-aligned technology companies comprised of sales, marketing, operations/support, development, and finance, the lowest level of management where accountability exists for profitability and long-term strategic issues is amazingly the COO, if one exists, or the CEO if not. Think about it. The sales organization is primarily concerned with revenue and tends to be short-term focused. Marketing typically supports sales objectives. Operations and support keep the services running well, maintain customer satisfaction and are primarily cost centers. Development focuses on delivering quality products on schedule and is also managed as an expense. Finance tracks revenues and costs but is in a limited position to influence them. So, who is thinking about profitability and achieving long-term goals? If it is nobody other than the CEO or COO, then there is a real danger that the myriad of decisions made every day by managers across the company will not be made with the right focus. One increasingly popular solution I am seeing employed is to elevate the role of the product management function, given its critical strategic responsibilities, and have it report directly to the COO or CEO (or for larger companies, the relevant business-accountable executive). This makes product management a direct member of the leadership team making strategic decisions about the business. This product management function will be chartered with providing market intelligence to inform the executive team, managing product profitability, and determining and driving product strategy consistent with corporate strategy. This function becomes a resource for the CEO/COO/business leader to explore and manage long-term opportunities. It is the function that has P&L responsibility and will drive business decisions deeper into the organization. It is a function that gives business leaders greater control over the plans that drive so many of the resources of the company, the roadmaps and product plans. Since product management is in such an influential position to execute the strategy, and needs to work with so many of the other functional organizations during product development and delivery, it may be desirable to include other cross-functional delivery teams in this function as well, for example project managers and business analysts. Some companies create a “Products” organization reporting tot he CEO/COO that has a general manager heading up each major product line with product management, product marketing, business analysts, and project management reporting into it. In one case I have seen, a large enterprise software company initially had their product management department report into the product development organization. When they felt they weren’t being market focused enough, they moved it under marketing. When product requirements appeared to be chasing short-term sales opportunities, they eventually settled on an independent products organization such as the one just described. One cautionary note. It may be tempting to use this new organization to manage all issues related to the product and to stuff it with too many related functions. Care must be applied to keep it motivated to improve P&L and stay market focused. It would be tempting to say that if there is a quality problem, give it to the products organization to fix. If revenue is slipping below its goals, have the products organization investigate. If a big customer is having a problem, give it to the products group to handle. In a product company, most issues are product issues. Having the products organization handle all of them will create a bottleneck and will divert resources away from its primary job, to be the eyes and ears of the company to the market. The other functions of the company are accountable for issues such as product quality (development), revenue (sales and marketing), and customer issues (support). So let them handle it. So let’s step back and take a look at what an end-to-end product planning cycle might look like when integrated with the company’s strategic planning cycle. Assuming that a company resets its corporate strategy, financial plans, and product plans once per year, the planning process would ideally occur during the 3rd and 4th quarters of the fiscal year in preparation for the upcoming year. During the first step, product management presents a market review to executive management sharing facts on market trends and opportunities, key customer needs, and competitor moves and positions.Though product management will keep tabs throughout the year on many of these items, this is the opportunity to update the information to make sure it is complete and current. Other functions may be invited to provide their perspectives on the market and customers as well. During the financial review phase, the finance organization presents results on the financial performance for the company overall, for its sales channels and for its products. Providing revenue and profitability by product is critical to making good product decisions and developing effective strategies. The next step is where the company’s executive team outlines its corporate strategy in terms of its vision, financial goals and its plan for achieving those goals. The corporate strategy should be explicitly presented to the product management team to facilitate development of a product strategy. For some smaller businesses, steps 3 and 4 may be combined into a single step. During step 4, product management develops its product strategy considering market dynamics, customer needs, financial goals, and corporate strategy. It specifies what changes to the products are needed and indicates the financial plan for each product area. The product strategy should be reviewed by the executive team to ensure alignment with the corporate strategy before proceeding to the next step. The final step involves the development of a product roadmap and more detailed release plans for the coming quarters consistent with the product strategy. 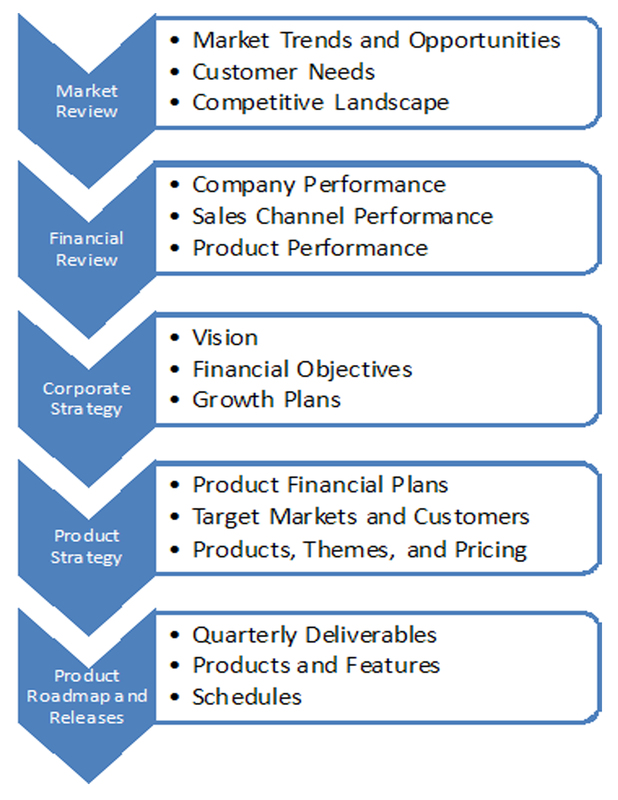 This roadmap becomes the official “product plan of record” and should be managed with formal change control procedures.This step is executed at the conclusion of the annual planning cycle and is repeated every 3 or 4 months to allow responses to changing market conditions and deployment schedules and should be re-approved by executive management. Product management must clearly understand the company’s objectives and direction in order to create product strategies and roadmaps that will help them to be achieved. By leveraging the product management team as a strategic resource, you will ensure that your products have been influenced by the best minds and information your company has available and you will gain greater control in driving your company’s success.